A pro-weed Arizonan explains why he just said no. “I do believe we’ll see more ARMs,” says Rick Sharga, executive vice president for Carrington Mortgage Holdings in Orange County, California. No, he’s not talking about the latest workout fad, fashion trend or weapons deal. He’s talking adjustable-rate mortgages — the loan vehicles that helped drive American “homeowners” off the foreclosure cliff during the Great Recession. Àla Thelma & Louise… only sadder. 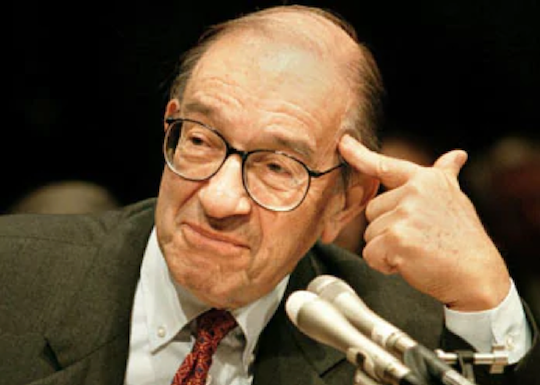 “A national severe price distortion seems most unlikely,” Greenspan said in 2004. Well, we’re not completely out of the woods… While ARMs accounted for just 1% of all mortgage loans applications in 2008, they’re up to 7% today. To give you an idea, about 20% of mortgages were ARMs in the 10 years before 2008, according to the Mortgage Bankers Association. So 7% is low; still, seems to be moving in the wrong direction. Robert continues: “ARMs are usually offered at one, three or five years, meaning the interest rate will adjust to market rates after that period. ARMs are a gamble — or a game of Russian roulette. Post-recession, that’s a fairly mainstream opinion, right? What’s not so mainstream is Robert’s take on homeownership in general…. “Many financial advisers will tell you that your house is an asset, but that is untrue,” says Robert. When Robert first published this contrarian opinion in his book Rich Dad Poor Dad — years before the housing crisis — “the so-called experts lambasted me,” he says. If you’re a homeowner — or at least a “mortgage owner” — you know nothing picks your pocket like home sweet home. So to be clear, something that takes money out of your pocket? “That is the definition of a liability. “Investment real estate,” Robert says, “puts money in your pocket each month in the form of rent. Now that’s a diversified portfolio. Not complicated… just the way Robert likes it. We introduced you to Robert last week. His best-selling book Rich Dad Poor Dad is based on his real-life experience with his highly educated father — who couldn’t get a handle on money — and his mentor who only had an eighth-grade education… and became the richest man in Hawaii. In terms of real estate, Robert says: “Rather than invest for appreciation, my rich dad taught me to invest for cash flow and to treat appreciation like icing on a cake. Next week, we’ll hear more from Robert; ultimately — his goal as an Agora Financial contributor is to show you how to play it smart… so you can make money in any market. [Ed. note: Robert is headlining our biggest event of the year, The Weekly Cash Flow Summit, on Wednesday, Nov. 14, at 1:00 EST. Regardless if stocks go up, down or sideways. Taking a look at the markets, the Dow’s up over 350 points at the time of writing — now just under 26,000. The S&P 500 is up 40 points, to 2,796.22, while the Nasdaq’s gained 150 points, to 7,530.79. The price of gold’s also floating higher, adding $2.30 to its price of $1,228.60. Oil, on the other hand, is down 17 cents or so, to $62.04 for a barrel of West Texas crude. “The campaign to legalize recreational marijuana in North Dakota threw in the towel,” says Marijuana Business Daily. But that’s the only setback among the four ballot measures in play yesterday. Michigan is the first Midwestern state to adopt recreational cannabis… while Missouri and Utah become the 32nd and 33rd states to approve marijuana as medicine. By the way, if you missed Ray Blanco’s exclusive live briefing with Montel Williams last night — complete with Ray’s discussion of his three favorite post-election pot plays… you can watch a replay of the event for a limited time. Here’s the link. Here’s the thing in light of the Democrats winning the House: “The stock market actually does well in gridlock because neither side of government can get major new legislation passed through the branches of government. “It’s all part of the checks and balances our government was intended to have,” says Zach. “So if Congress is split between two parties, things in politics become a bit more stable, which investors love! “Since 1950, stocks have rallied in the year following midterm elections every single time,” adds retirement specialist Mike Burnick. “We’re moving into the ‘sweet spot’ of the four-year presidential cycle right now. “Comb through the historical data and you’ll find the S&P 500 rises an average of 12% in the six months from November through April after the midterms, and that period has posted gains nearly 86.4% of the time over the past 90 years,” says Mike. And that number balloons to $110 billion this week and $145 billion next week. 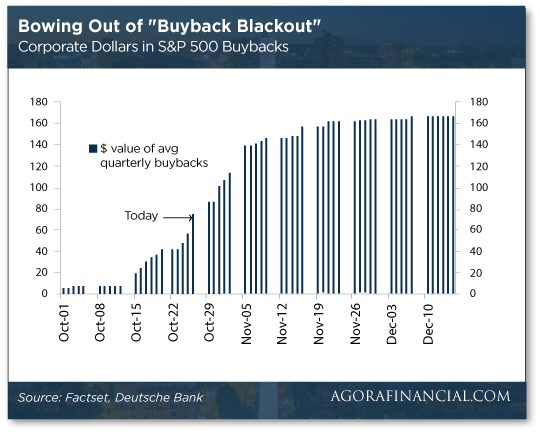 To Mike’s way of thinking: “We have a market that is extremely oversold, an economy firing on all cylinders and a tidal wave of buybacks about to spark a massive run in stocks. More on de-dollarization: “The contract between Moscow and New Delhi on supplies of Russian S-400 air defense systems will be settled in rubles,” RT reports. Just another sign Russia’s upping the ante on moving toward the de-dollarization of its economy. “The Kremlin is looking for an alternative to the U.S. dollar in mutual settlements with international partners,” RT continues. “Earlier this month, President Vladimir Putin said safety and security of the economy was the major driver behind the decision to eliminate the role of the U.S. dollar. As for India, it’s looking to fortify its military. 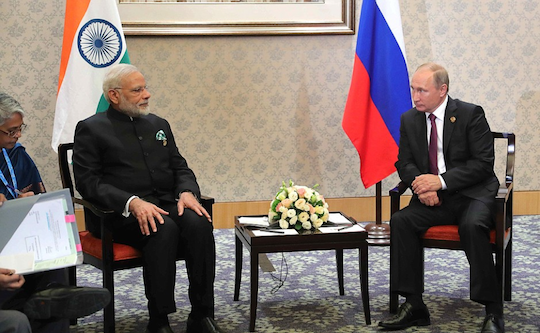 In October, India struck a deal with Russia to purchase S-400 missile systems worth $5.4 billion or, doing the conversion here, about 357 billion rubles. RT reports the country’s also planning to buy Russian T-14 Armata tanks and guided-missile frigates. And the two countries might work together on developing next-generation fighter jets. In terms of India paying in rubles, Jim says, “India might have accumulated the rubles from prior sales to Russia, or Russian banks might lend them rubles to facilitate the arms purchase. Either way, there are no dollars involved. “Once trading relationships like this get started,” says Jim, “they tend to grow and reinforce themselves as the two nations look for ways to invest or spend the ruble balances. “This deal by itself does not mean the end of the dollar,” Jim continues. Of course, the spotlight’s been on Russia and China — with their stockpiles of physical gold — trying to unseat the dollar’s global dominance. “My voting precinct ran out of ‘I Voted’ stickers, so I took a picture with a sign instead,” tweeted a voter in Mississippi. So in response to the sticker shortage — and to help with humble-bragging — Facebook and Snapchat provided “I Voted” filters for Election Day selfies. Exactly what the Founding Fathers had in mind… heh. But hey, The 5’s not above admiring a good “I Voted” sticker. 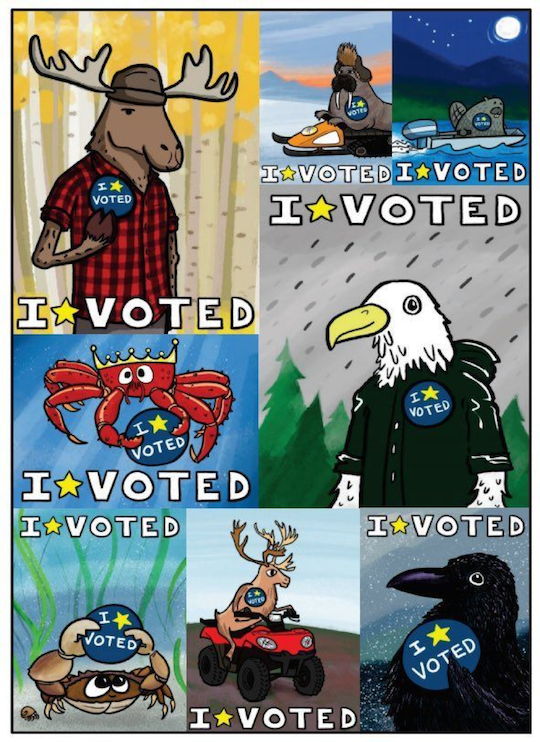 Artist Pat Race of Juneau was tapped to create these nifty works of art for the State of Alaska Division of Elections. The sticker in Maryland — where Agora Financial’s headquartered — just, meh, didn’t pop in selfies. The 5: The reader from Arizona’s responding to something we said last week concerning two legal weed failures in Arizona and Ohio… and holding powerful law enforcement lobbies partly responsible. “The bill was poorly designed, with profits going to building new government agencies to regulate, track, tax, etc. There was no limit to how much would be spent on these agencies. If any money happened to be left over, it was to be split between several groups including the schools. The 5: Fair enough… and now that we have a third recreational weed failure in North Dakota, we’d be interested in feedback from the Peace Garden State, too. P.S. Rich Dad Poor Dad author Robert Kiyosaki, has a brand-new strategy that will show you how to collect thousands of dollars each and every week.